The business headlines have been full of news about store closings. Multiple chains are closing 100s of stores. This once flourishing sector employed thousands, and now flounders. What strategic lessons can be learned from US retailers mistakes? The question and the learning opportunities for other sectors became the basis of the April 21, strategy roundtable’s diverse group of attendees. A few articles offered some summary context of the state of the sector, a little history about Macy’s and a series of growth related insights from disruptive innovation strategy firm , published in MIT Sloan Review offered by Fahrenheit212. Surprisingly, after posting the articles in late March, a flood of store closings and their back stories continue to appear, leaving many to wonder what’s up for several of the biggest brand names in retail. In the short horizon that Macy’s lost $10billion in value, Amazon rose $300bil to reach its current six year low of $6bn, considerably off its peak of $24bn in 2006, Amazon’s current valuation just north of $370bn continues to accumulate market share. The US Big Box Retailer’s current state isn’t just bad luck and it turns out to be less than easy to pinpoint. As Macy’s and other retailers struggle to maintain a fresh look, their poor performance ripples across the sector as one domino topples over another. No excuse for Management to become such terrible shop keepers, no matter how much online competitors divert their attention. A poorly appealing store worsens its merchandise and thin staffing ratios erode service combine to turn off customers too. Sears posted year on year decline over 9 percent, and 1.5x losses for its mobile application as it’ digital transformation efforts prove insufficient. Cost cutting may help a business survive, but won’t deliver growth that makes it thrive. The creative fuel behind the early growth of Sears, Macy’s and the general merchandisers also expanded their market and showed their competitive capabilities. Amazon isn’t a new disruption and the blanket of doom seems to spread uniformly across the sector. Did you know from 1990 to 2014, US retail employment grew by 2.3 million, of which the vast majority was among non-store retailers? The total sector grew by 17 percent, while non-store employment grew 27 percent. In this same period, a combination of productivity gains and drops in labor compensation reduced the sector’s unit costs. These reversals in historic trends pointed out by Chicago Booth faculty Chad Syverson and Ali Hortaçsu in their recent review of US retail, should help large retailer’s right? More part-time workers, more automation and lower wages do improve operating margins, but doesn’t mean growth will follow. The bigger strategic problem is timing and the ability to compete. The efficiency gains across the sector appear just as retail’s share of total US economic activity continues to shrink, and correspondingly its share of total US employment diminishes too. Syverson and Hortacsu found ample research that relates technology, management, variety and productivity with shaping the success and survival of some retailers. Surprise, greater productivity may or may not result from any one of these factors, and growth from greater productivity seems less causal too. Physical operations, however do prove important to both e-commerce and store based retailers. In other words, the formula for growth has grown more complex. Hold these thoughts. Their extensive data review also makes clear that the data does not support these narratives. Online retail supremacy has not yet arrived, and likewise the scale and influence of the supercenter/Warehouse merchandisers continue to grow. The latest (4Q2016) US Census reports total retail sales of goods and services at $1,235.5Billion and estimates ecommerce at $102.7Billion (8.3 percent of total). Year over Year growth rates of 4.1 overall were considerably lower than ecommerce, which grew by 14.3 percent. Both grew only 1.9 percent over 3Q2016. The analysis by category over time and projection of the trend lines summarized below makes the story more interesting. The summary resembles an 80/20 analysis. The categories with the biggest ecommerce sales represent the smallest category of total sales. A recent edition of MIT Sloan Review published three “new” growth-related truths, and framed our discussion. The truths as you see, resonate with many of the common precepts around innovation focused strategy not just those of its authors from Fahrenheit212, part of Deloitte. Analysis won’t reveal your way to the future, you must invent it. Competition is not linear, it’s exponential and disruptive. Success depends on internal capabilities to catalyze an organization into action, and make something new happen. First, analysis has broadened in many ways, but its purpose and practice still largely determined by Leadership and its management priorities. Limiting the scope of Analysis to tactical issues, confirms what works, or drives larger strategic projections as in what’s possible. Today, analysis and analysts review data in every function across the entire enterprise. Organization benefit from analysis when they also commit to standards of consistency and integration, that also assure their results don’t confuse but reveal factors important to business growth. Successful analysis also relies on the availability of data and analysts capable of its interpretation. Today’s connected world offers ever increasing opportunities to collect, store and process more data cheaply, and Enterprise Resource Planning Software systems greatly simplify and automate the reporting of standard views of activities in every function. Planning and Process Improvements both suffer from a shortage of analysts capable of integration and interpretation of big data within a business context. The standards for business reporting reinforce old habits, rely on established metrics and existing interpretations, and thus miss cross-functional opportunities to share findings and develop new insights. Is perspective and Interpretation hard to come by, or just hard to hear? For example, to reach $150 million in annual sales, took Walmart 12 years and 78 stores. From its inception in 1994, Amazon took only three years. Further, Bezos reported 1998 net income remained close to zero as he his continuous focus on growth tirelessly plowed cash back into business development. Not only did Amazon’s sales success patterns defy conventions of growth metrics, their unconventional use of data, analysis supports their creative capabilities and discoveries to understand what was contributing to their growth and working for their customers too. In 1999, Forrester Research reported annual web retail sales as a whole jumped from $700 million to $20 billion, though it remained less than 1% of total retail sales. Growth was anything but linear—but the base too small to catch the eye of established, experienced retailers. In 2001, Border’s CEO Greg Josefowicz was a very experienced and sophisticated retailer and no stranger to Ecommerce having come from Peapod. The fractional contribution of the chain’s online sales however led him to outsource the channel to Amazon. This was the same year, that Apple released the iPod. Unless you were closer to online data, and keenly understood its opportunity to track customer journeys and gain behavioral insights, chances are you too would have overlooked the value of further investment. A 2016 interview with Michael Edwards, interim CEO Borders from January 2010 through its bankruptcy and liquidation in July 2011 revealed something else. Edwards buys into Fahrenheit212 philosophy that little can prepare you for wholesale disruption. 2010 was a period of widespread economic growth and US retailers sales were growing, but not uniformly; and not if you were in the book and electronics industry (aka ESMOH)—again hold that thought. These hindsight claims made me wonder why Border’s didn’t feel any sales fallout from the iPod or Apple earlier, or when and why they misread Borders’ customers change in shopping patterns? Is your analysis reporting monitoring activity or action oriented? What analysis and shared insights did Borders leadership encourage? Were traditional metrics misdirecting their strategic priorities and explain how their widespread physical presence was suddenly without value? Remember the dominant narrative that Syerson and Horascu found? Put that thought together with the analysts’ tunnel vision driven by elaborate ERP systems that accurately report established growth metrics. Monitoring Same Store Sales, Sales by channel or category breakdowns do reveal changes in shopping patterns, but are they actionable? Even the Ecommerce reports from outsource vendor Amazon likely to include detail level data and helpful comparisons. Different stories and trends emerge when analysis incorporates outside reference points. Benchmarking internal data to publicly available government statistics, for example, not just aggregate retail sales vs ecommerce but within their category might have raised alarm bells early. Time pressures and priorities don’t have to stop anyone from creating a look similar to Syerson and Horascu cumulative look. What are you using to define your market and meet the needs of your customer? Rethinking how to deal with consumers is more than a marketing plan it’s a strategic imperative. At least that’s what Mike Edwards realized when he stepped up from the role of Chief Marketing Officer to help turnaround Border’s in 2010. Conventional analysis techniques and formats don’t address deeper questions that test the validity of your strategy, or draw attention to important indicators affecting your results. 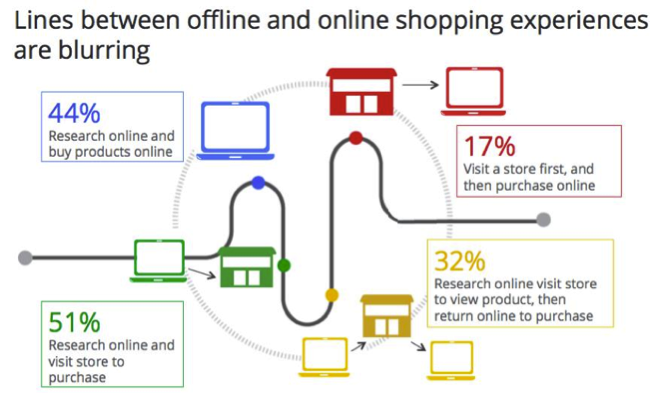 If you are a big retailer, and you moved online, you have big data. Macy’s and Sears both moved somewhat early to create an online presence before 2001. Maybe they saw online as an efficiency improvement to catalog sales, they still kept them independent of ongoing business activities. Perhaps their experience relied too heavily on mass-market demographic information that large vendors like IRI made easy to digest. Capabilities to analyze the flood of big data and the detail byte size moves of website visitors exceeded the capabilities of the most nimble and agile of digitally born players. A gap emerged between traditional marketing training and opportunities the web’s detail user journey tracking revealed. Do you appeal to demographic and assembled personas, OR are you responding directly to individual users’ needs? This gap mirrored the unfolding of a larger competitive divide across all businesses and further segregate online activities into separate operating units. Bigger organizations’ centrally controlled decision making contrasted sharply with the emergent capabilities of online technologies and few recognized the important tasks required to rethink how to deal with evolving learning by their consumers and suppliers. No problem for Excite, the leading search engine in 2001 and Amazon. “Any active data we get, [Joe Kraus, VP of Excite explained] we put to instant use on the page…simulating personalization such as zip-code based weather forecasts.” Amazon without knowing any personal information, began to pass on simple recommendations based on the cookie data. Cookies track specific behavioral data online, that was difficult to connect to purchase and profits, but still offered considerable strategic insights to anyone who took the time to look. Ironically, only a handful of advertisers possessed the technical and marketing experience with this growing data, which meant the playing field for ably using the information to optimize profits was wide open. Instead of investing and experimenting, many continued to apply the store sales success criteria to online sales. I’m no retailer, but I did learn a few things from my father who created a handful of custom drapery stores that flourished in the 50s and 60s only to succumb to changing demographics in the 70s. Purchasing frequency and customer loyalty aren’t accidental. Relationships build on more than serendipity. Knowing your customer earns trust, most evident when your recommendations produce sales. Note, this approach doesn’t depend on markdowns or price drops to attract interest or make a sale. Convenience is a perception not the reason passers-by cross the threshold (or click through). Locations with heavy traffic create greater opportunity, sure, creative storefront displays (content) arouse interest or curiosity, and sales follow when entering visitors rewarded positively. Invention matters but delivers greater value when balanced with conventional, basic goods and service options. Drawing customers in, attractive presentation of merchandise has always helped successful merchants move what had to be moved. It’s been true for sellers regardless of their circumstance and environment. Every trend has an origination point, successful analysts recognize the significance early because they often understand change as relative. It’s easy to see the internet as a significant force today, but in the mid-1990s, analysis shown earlier documents the case’s weaknesses and risks. In 1995, Grace Mirabella, former editor of Vogue broadens the context in her memoir In and Out of Vogue. She describes dramatic shifts in the minds of consumers about department stores’ relevance compared to their hey day in the post-war period. 22 years later, her words don’t sound the least bit out of date. Designers became all-powerful, cutting deals that promoted their name, and reducing retailers into commodity distributors who all carried the same things. In 1994, Jeff Bezos, left his job as hedge fund manager for DE Shaw. Interviews reveal he spotted opportunity in the expanding internet, which led him to start the company he later names Amazon. His analysis skills suggest he was deeply familiar with another trend that began in the 1970s, one, that Mirabella in her backward look from her publishing perch misses–the evolution of Electronic Digital Interfaces (EDI) streamlining procurement. Personalization historically differentiated the high end of the market. Sales persons kept coveted black books that contained intimate notations about their customers ranging from size, color and style preferences to special occasion dates and family details. Amazon wasn’t the first to collect user data, and was by no means able to mine it and yet they produced “personal recommendations” beginning in 1998 without investing in developing complex analysis capabilities. That came considerably later. In 1999, Academics Joe Pine and James Gilmore publish The Experience Economy continues to shape many retailers strategic perceptions. Their thesis builds on the retailer narrative and emotions Mirabella evokes, and connects to my own Dad’s experiences as a lifelong retailer. Experience, they explain is now the metaphor of choice. What else summarizes the combination of factors that attract and convert a visitor into a loyal, frequent customer and/or influencer? Keeping experiences relevant and meaningful amidst the backdrop of rapidly changing forces that impact every aspect of your business model demands rethinking of the employee not just the customer experience. Unlike the leading CEO retailers failing, Bezos shares more in common with the great merchandisers of the past. His digitally born and situated store front owes its business growth to continuous, bold experimentation as well as deep analysis. I don’t know what metrics are commonplace at Amazon, but their investments in data analysis capabilities and machine learning are self-evident by the efficiency and sideline cloud business they produced. The speed in which consumers change their behaviors prove challenging for every retailer, non-store or store. The online e-tailers’ unique environment, fully equipped to capture detailed user journey references and history can use the same mechanics to deliver immediate responses ranging from mass personalization to levels of deeper customization. Amazon’s strategy embraces the principles of continuous learning at its core to control every aspect of the buyer’s experience. Similarly Apple, another company with astronomical market valuations entered the retail market in order to control and enhance the buyer’s experience. Today, both have physical presence that emphasizes service and consumer education. Retailers who miss the ability to construct a holistic strategy, increasingly are dying in the evolution of responses or deeper customized, delivering valuable feedback enabling the business to continually improve its offerings and willingly take risks associated with invention. Amazon learned quickly how to draw customers online, present the merchandise attractively and yes move what had to be moved. He didn’t have to balance the demands of managing existing outlets, nor accept established practices associated with large scale distribution networks, instead he invented his future. Is it Too Late for a Web Strategy? If you don't know this man, then you're missing out on one of the more popular twists in popular culture and marketing of 2010. This is the Old Spice campaign's man of mystery. Intentionally I did not insert the web video, nor am I interested in chasing down the viewer stats, though sales report isn't great. It's here because the ad reference exemplifes multi-channel linked marketing strategy and came up in last Friday's monthly Chicago Booth Alumni Club's Discussion around Strategic Management Practices. Wearing my research hat, and doubling as a typical consumer, the first place I turned to find the reference was to type the key word phrase "old spice man" into my google search bar located at the top of my web browser. My search was not to purchase, engage in conversation or to gain proximity to someone with product experience –that would need some different key words. The campaign as well as my search process shows the evolution of the internet and the effect of its influence in our lives. 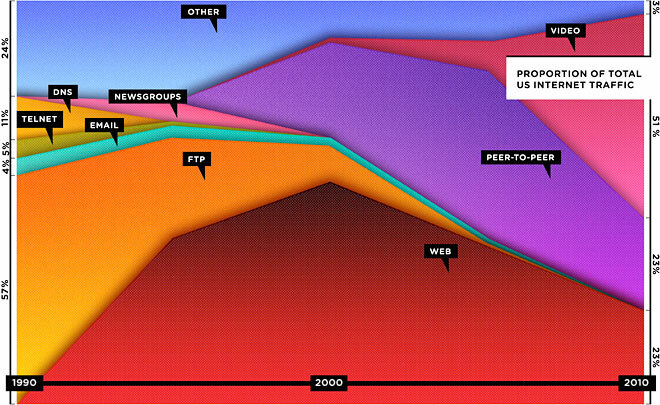 The shifting trends exhibited below in this wonderful chart was the focus by Chris Anderson and Michael Wolff in the provocatively titled September 2010 article in Wired The Web is Dead, long live the Internet . CISCO compiled data using the Cooperative Association for Internet Data Analysis (CAIDA). The chart suggests that Video and Peer to Peer traffic is increasing while the use of the world wide web is declining. This data is somewhat misleading and the chart's suggestions that mobile apps, and other specialized channel options, will displace the web browser is not so clear-cut.
" Continuing its growth in traffic, connectivity, and complexity, the current Internet is full of applications with rapidly changing characteristics." Overall, CAIDA has found that traffic on the internet continues to grow, which is not adequately represented by the two- dimensional graph CISCO and WIRED depicted. Growth does accurately reflect the transition and growing emergence of traffic off the world wide web and into alternative internet based transmission paths (e.g. mobile based and other applications that allow real time streaming). This same transition mimics strategies used by effective marketers who link the brand messages and campaigns across multiple media platforms. Key words provide the bridge. The more consistent their use across the growing number of media platforms, the more certain an organization's promotion efforts will intersect key consumer touch points on or offline. Ideally, consumers pick up these same key words and carry them across other natural communication channels, further enhancing the brand's reputation and in theory increasing sales. If your business is selling Search Engine Optimization (SEO) this emphasis on key words appears great for business. It's not however where a capable marketing strategy should invest the majority of its budget. Not merely because there is some danger to pursuing this strategy (see the The dirty little secrets of search in last week's New York Times); but the greater, more complex objective is reputation management and not key word optimization. Historically, brand owners/creators controlled media messaging and placement. To successfully sell, you "paid" for the privilege of being placed in front of consumers walking through the yellow pages or by a billboard, listening over radio/TV or their eyeballs scanning newspaper or specialty publications. Product packaging, placement and promotion are often budgeted separately and only occasionally linked for a "special" promotion (e.g. cause marketing or a contest). The rise of the world wide web, added the category of "owned" media to the marketing mix and budgets had to cover the cost of website development, content writers and traffic analysis, including SEO. With Social Media, a third area– "earned" warrants increasing budget and management attention to monitor the customer-created channels and chatter of your brand enthusiasts as well as brand detractors. (see complete description in Branding in the Digital Age by David Edelman). The Edelman article's case study of a TV manufacturer across one touch point within the wider consumer decision journey proves far more instructive than my earlier reference to the Old Spice ad and its multi-channel focus. "A costly disruption of the journey across the category made clear that the company’s new marketing strategy had to deliver an integrated experience from consider to buy and beyond . In fact, because the problem was common to the entire category, addressing it might create competitive advantage." Unlike Old Spice, the manufacturer opted to shift the marketing emphasis away from paid media. Focusing on owned and earned media seems to enhance the effectiveness of their key words and multi-channel linkages, and engage traffic where it mattered most at the buy, and enjoy, advocacy, bond touch points. This is not a prescription for all brands, but the case is instructive in identifying the disconnects and deficiencies in common web based strategies, or even of marketing extravaganzas disconnected from the ongoing conversations that are circling your business, product and/or brand. Whether or not you belief in Chris Anderson's prognosis about the death of the Web or buy into David Edelman's Consumer Decision Journey research, few organizations appear to have fully leveraged these changes. Increasingly, an ability to execute and efficiently allocate resources to address the demands presented by the growing number of communication channels will distinguish successful companies from their competitors. The changes create more opportunities for strategy to take a more commanding role in managing and driving the combined efforts, either internally or with the help of outside specialty firms. Social networks are informative, free sources of intelligence that naturally build out and generate mutual trust and benefits to buyers and sellers. The role of the marketer is merely to influence and no longer the producer/director of the brand experience. The responsibility for marketing is changing and increasingly is upending internal role limitations and requiring participation from unlikely sources e.g. corporate governance, communication standards and guidelines. Employees share roles with customers and the more acquainted with internal policies, strategies and planning the more they can aide and assist in wider message consistency. Authenticity has become ever more important. Fluidity and increasing knowledge of terminology around the digital communications space is a valuable skills set…not just for marketers and IT folks. As reputation management rises and people do business more and more with the people that they know, is there anything really being created of value, and are other marketing and sales efforts as necessary? How do these lessons translate or enhance B2B sales? It's not the web vs. the internet differentiation that matters, as much as recognizing how one innovation(social media) has brought into focus an array of deficiencies and gaps within an organization (marketing departments) as well as an industry (e.g. advertising) The challenge is how to best integrate the old with the new. In the end, the prescription to know your customer before creating your strategy remains the first and foremost lesson. Knowing what your customer wants will always be helpful but successful business requires more. True differentiation in products being marketed remain beneficial but the emphasis should be toward innovation in developing products. Important to remember the shape of the adoption curves with new technology and Chris Anderson's point that new doesn't replace old. New merely creates more table space to accommodate more preferences. The challenge is the frequency we change, resort and revisit our marketing activities and resource priorities. Both articles confirm the importance of social media and keeping up with changing technologies. They also call attention to the the challenges organizations face in trying to bring them together to create successful communities around their products and/or brands. Any added thoughts, perspectives or cases are welcome. What strategy will help Coca Cola and McDonald's continue to Grow? Sports analogies for business – how effectively do their impact and influence extend beyond the game ?